The Air Force’s light attack aircraft flight demonstration is officially on the books, with an experiment scheduled this summer at Holloman Air Force Base, N.M.
That event could be the first in a series of demos to determine the business case for a program of record, which has been termed OA-X. A second phase of the experiment would send those aircraft to the Middle East, in very much the same manner as the Combat Dragon II exercise earlier this decade, when two OV-10 Broncos were deployed to Central Command, Goldfein said. In a speech at the Air Force Association’s air warfare symposium, Acting Air Force Secretary Lisa Disbrow said the experiment will prove whether it makes sense to add money to the budget for a low-price aircraft that could be procured almost immediately to do low-end combat in the Middle East. “We want to see if there’s a business case there,” she said. “This concept could free up higher-cost, higher-performance platforms from doing low-threat missions, which would allow us time to prepare for more complex threats with those assets. It could also help us absorb new pilots and be useful as we work with allies and partners.”..
At this point, it’s unclear whether the Air Force will limit its options to inexpensive turboprop airplanes or if a more advanced light fighter could be of interest. Much excitement has surrounded the Textron AirLand Scorpion since it was released on the market. The aircraft hasn’t secured its first order yet, but its low operating and acquisition costs — less than $20 million per unit and $3,000 per flight hour — could make it a good fit for OA-X. Other low-cost options could include the Beechcraft AT-6 or Embraer’s A-29 Super Tucano. If the service considers higher-performing entries, some T-X entrants — particularly Lockheed Martin’s FA-50 or Leonardo’s M-346 — could be other alternatives. Is the U.S. Air Force’s OA-X Light Attack Aircraft Really Going to Happen? The Senate Armed Services Committee (SASC) has added $1.2 billion to the fiscal year 2018 National Defense Authorization Act (NDAA) for the U.S. Air Force’s OA-X light attack/observation aircraft effort. The service will be conducting an experiment this summer to determine if such an aircraft would be useful to perform missions over permissive airspace in place of much more expensive and capable fourth and fifth-generation fighters. The Air Force is expected to test four different aircraft types including Sierra Nevada’s A-29 Super Tucano, the Hawker Beechcraft AT-6, the Textron Scorpion Jet and the Air Tractor AT-802U during its experiment. The Senate—and particularly SASC chairman Sen. John McCain—wants to push the Air Force into buying a fleet of roughly 300 OA-X aircraft to help relieve the ever-increasing burden on the service’s tactical fighter fleet and to help season younger pilots. “The idea behind funding this is actually to move this program along,” a Senate aide told reporters during a SASC background brief on June 29. My gut says they go with turboprops to avoid buy a "Jet fighter" which someone in congress will point to as being cheaper than a F-35. There are advantages to turboprop fighters in certain scenarios. Not all of them due to cost. The amount of loiter time per machine is not itself significant. Constant coverage is. During Fallexes in Germany, we had almost constant access to A10 coverage, with fresh pairs every fifteen minutes, when warranted, in 4 CMBG's area. One pair would head home as we briefed the new one for its run. The schedule rotation was based upon ammunition duration, not fuel. There were always multiple aircraft, rotary- and seized-wing, aloft in Kandahar and eager to pounce, and as soon as one pair ran out of ordnance another would replace it. We took out IED emplacement teams with Predator (Hellfire) followed by B1 (500lb JDAMs) followed by A10 (cannon) and Kiowa (.50 cal/2.75 in rocket/full-mag single burst M4 out of the left-hand door) followed by F15 (500lb JDAMs) combinations, for example, with no interruption. Aircraft were lightly loaded, presumably to avoid having to land at high weight with unexpended weaponry, as most missions did not see anything fired/dropped. Thank you for this post as I don't have any real first hand knowledge. Do you feel a multirole A/C is the best path going foward for something as defined as ground support? To me it seems like its a huge waste of money for something with less compairable capabilities. In much bigger militaries, specialization has more viability. It is no longer required to overfly targets at low levels to attack them. Technology has advanced, and will continue to do so. Weapons have more standoff capability, detection/designation/guidance systems have improved (laser, millimetre-wave radar, GPS), platforms are increasingly being connected via networks to share target and other information, cockpit workloads have been decreased, and low-observable technology has reduced the chances of radar detection and virtually eliminated the chances of radar tracking and guidance. Armoured vehicles replaced cavalry in the First World War. Firearms replaced bows, crossbows, and trebuchets. Oh I agree with that, but there has to be a value of the psychological effect of having constant overhead a/c towards a less robust enemy. Even though we can strike from far, I would think the sound and visuals of having AC buzzing their heads would benefit our guys with boots on the ground. Don't underestimate the effect of targets just blowing up, and not knowing where it's coming from, or who's next, and not being able to stop it or even shoot back. Early Hellfires were laser-designated. Apaches could fire sequentially, have multiple missiles in the air, and move the designator from one target to another as each blew up. The helicopter could be up to 8 k away, so it was hard to detect, but still had to be exposed throughout the engagement process. The Longbow system (millimetre-wave radar) on AH64D was a huge step forward - a single helicopter simply had to unmask for just long enough to do a single sweep of the battlefield, share target information with the rest in the company, which would then be fed to the missiles (now fire-and-forget), and all could then be fired simultaneously. The ultimate result was virtually identical (but fewer missiles would be launched as the company commander could block off individual killzones for each machine and thus avoid multiple strikes on targets), with one difference from the enemy's point-of-view: instead of his vehicles blowing up in sequence when engaged by A-models, they would all blow up simultaneously when engaged by D-models. Instant, simultaneous mass death; nobody got any warning. One free-thinking group of aircraft designers considered how to make a new multirole fighter. The result of the study was a design for an aircraft like nothing else before or since. Even more surprisingly, this exciting plan for a futuristic superfighter came not from the elite fighter houses of the USSR or the US, but an unknown company in New Zealand. The aerodynamic configuration was unusual to say the least, consisting of a ‘self-stabilising aerofoil’ formed by the fuselage between the tailbooms, with upper surface blowing across all lifting surfaces providing the aircraft with extreme short take-off and landing capabilities. Internal weapon bays could carry up to ten 1,000-Ib bombs and external pylons could carry an additional 3,000 Ibs. The gun armament would have been ferocious comprising either four 30-mm Oerlikon cannon or two 20-mm M61A1 Vulcans. Maximum speed would have been 740mph, and it would had a lo-lo-lo tactical radius of 480 miles with maximum bombload. The Addax-S was even more impressive. This was a supersonic air-superiority fighter based on the same configuration, with outstanding manoeuvrability. Of course, The New Zealand Government was never really going to fund either Addax, but it was an intriguingly left-field glimpse of how fighters could have evolved. The designs were released in 1982, but even today they appear more futuristic than any known aircraft programme. A battlefield support variant was also proposed, which from the one illustration I can find is suggestive of an attack helicopter fitted with field wings rather than rotors. Looking at the United States, there was a 1980's vintage concept as well which might solve several issues (including new high performance trainers), the Northrop F-20, an evolution of the F-5 with a much more powerful engine. Air Tractor is best known for pest control and fertilization. But the Olney, Texas-based company’s AT-802 agricultural aircraft has evolved from crop duster to firefighter, narcotics eradicator and now a surveillance and strike platform for counterinsurgency operations. The newest AT-802 combat derivative—the L3 Technologies AT-802L Longsword—has been invited to fly in the U.S. Air Force’s OA-X capability assessment of lightweight-attack platforms; alongside the Textron Aviation AT-6 Wolverine, Scorpion Jet and Sierra Nevada Corp./Embraer A-29 Super Tucano. The hardy agricultural aircraft might not be a perfect fit for the Air Force’s proposed light-attack and fighter pilot training fleet, but L3 and Air Tractor are mostly eyeing opportunities for export and special forces missions. 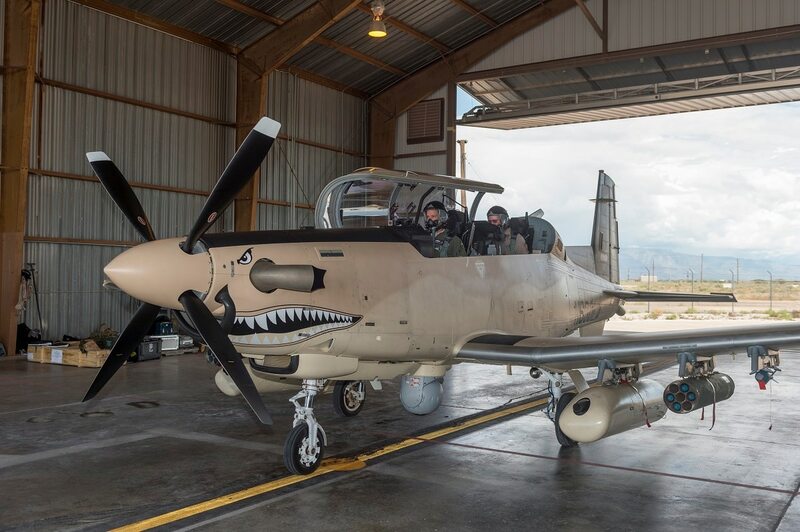 Air Tractor confirms interest in the newly launched Light Attack Support for Special Operations (LASSO) program, a partnership between the Air Force’s fighters and bombers directorate and U.S. Special Operations Command’s Office for Fixed-Wing aviation programs. The AT-802, a single-engine turboprop, flies low and slow, carrying almost 2.5 times its own weight in fuel and stores. It was used by the U.S. State Department for several years to eradicate coca plantations in Colombia, the source crop for cocaine and a critical income stream for the FARC rebel group. This month at Holloman Air Force Base in New Mexico, an unusual event is occurring. For the first time since the end of the Vietnam era, the Air Force is conducting a flying experiment with combat aircraft. This nontraditional event, bringing together four major commands and three industry partners, was put together in only five months. The cost is in the single digit millions. Here, a mix of test pilots and operationally experienced aircrew are putting four light attack aircraft through their paces. The method? Experimentation. The objective? Learn. The Air Force is interested in assessing the potential of low-cost, commercially developed ground attack aircraft to conduct the kind of combat missions that have composed the vast majority of combat missions in the last 25 years. The light attack experiment is the first large-scale experiment of its type in decades. Two years ago, this would have been impossible. The Air Force had no money appropriated for experimentation. Budgetary pressures imposed by the 2011 Budget Control Act took a toll across the board, affecting readiness, force structure, manpower, and research and development. But in the past two budgets, small amounts of money have been set aside for experimentation. The Air Force established a brand-new organization within Materiel Command — the Strategic Development Planning and Experimentation (SDPE) Office — to facilitate experimentation. Over two years SDPE has toiled in relative obscurity to rack up a series of small successes, focused on emerging weapons and tactics. The light attack experiment is the first full-scale, live fly event, with aircraft conducting representative missions on tactical ranges, complete with precision and non-precision weapons, aerial gunnery, and simulated targets, supported by terminal attack controllers on the ground. The Air Force is below our minimum sustainable force size. We have too much mission and too little force. Maintaining sustained combat operations for 26 years has taken its toll. We have worn out our tactical aviation fleet, sacrificing readiness and size, and delaying modernization in the face of relentless demand for combat airpower. In order to successfully rebuild and re-train the force to handle major combat operations against a traditional, nation-state enemy, we have to get some breathing room. By switching the weight of burden to aircraft that are less expensive to purchase and easy to sustain and operate, we can shift the majority of day-to-day operations to aircraft designed for the kind of relatively low-intensity warfare that has characterized air operations since Operation Desert Storm. A push by experienced combat aviators for this class of aircraft has been brewing by nine years — but the lack of government-collected data has made this a hard sell. The experiment has provided an opportunity for U.S. Air Force and industry aviators, maintainers, engineers, and acquisition personnel to exit their comfort zones to engage in old-style, in-depth data gathering with the objective of creating a cadre of experimenters who are better-informed about modern, commercial aviation developments as they apply to combat aircraft. It’s not business as usual, and many of the participants have jumped at the opportunity to be part of it. Col. Mike “Starbaby” Pietrucha was an instructor electronic warfare officer in the F-4G Wild Weasel and the F-15E Strike Eagle, amassing 156 combat missions and taking part in 2.5 SAM kills over 10 combat deployments. As an irregular warfare operations officer, Colonel Pietrucha has two additional combat deployments in the company of US Army infantry, combat engineer, and military police units in Iraq and Afghanistan. He is on the staff at Air Combat Command and is at Holloman AFB for the experiment. The views expressed are those of the author and do not necessarily reflect the official policy or position of the Department of the Air Force or the US Government. Well, since there is a Canadian there for that test, I wouldn't be surprised if there's a write-up about it either in official or unofficial circles. Following the Light Attack Experiment conducted in August 2017, the Air Force announced its intention to continue experimenting with two non-developmental aircraft, the Textron Aviation AT-6 Wolverine and the Sierra Nevada/Embraer A-29 Super Tucano, from May to July 2018 at Davis-Monthan Air Force Base, Arizona. "Rather than do a combat demonstration, we have decided to work closely with industry to experiment with maintenance, data networking and sensors with the two most promising light attack aircraft — the AT-6 Wolverine and the A-29 Super Tucano," said Secretary of the Air Force Heather Wilson. "This will let us gather the data needed for a rapid procurement." Further experimentation will examine logistics and maintenance requirements, weapons and sensor issues, training syllabus validity, networking and future interoperability with partner forces. The Air Force will also experiment with rapidly building and operating an exportable, affordable network to enable aircraft to communicate with joint and multi-national forces, as well as command-and-control nodes. "This effort to find a lower-cost and exportable aircraft for permissive environments is directly in line with the National Defense Strategy," said Chief of Staff of the Air Force Gen. David Goldfein. "A light attack aircraft would not only provide relief to our 4th and 5th generation aircraft, but also bolster our interoperability, so we can more effectively employ airpower as an international team." The light attack effort supports our nation’s defense strategy to counter violent extremism on a global scale, alongside allies and partners. A light attack capability could sustain competence in irregular warfare, maximize capability from financial investment, and harness existing, innovative technologies. A light attack aircraft option not only offers additional value and flexibility, but also accelerates modernization of current and potential partner forces who do not require advanced fighter aircraft. Five international partners observed the first phase of the Light Attack Experiment, and the Air Force plans to invite additional international partners to observe this second phase of experimentation. The Air Force expects to have the information it needs to potentially buy light attack aircraft in a future competition, without conducting a combat demonstration, based on data collected during the first round of the experiment and future data anticipated to be collected in the next phase of experimentation [emphasis added]. "Rather than do a combat demonstration, we have decided to work closely with industry to experiment with maintenance, data networking and sensors with the two most promising light attack aircraft -- the AT-6 Wolverine and the A-29 Super Tucano," said Air Force Secretary Heather Wilson. "This will let us gather the data needed for a rapid procurement [emphasis added--Carla Qualtrough note].".. "In less than five months, we had four aircraft on the ramp to test at Holloman Air Force Base and, last night, I just got the test report. So in less than 11 months, with five pages, we have tested four aircraft for a potential light attack aircraft for the United States and allies," she said during a December Senate Armed Services Committee hearing on acquisition reform. That is intriguing. I wonder if it might not have implications down the road for Canada's fighter selection. Does it have the potential to make inter-operability less platform dependent? Improving the ability to create a network of platforms of varying ages, nationalities and capabilities? The head of the service's aviation arm is eager to get modern choppers, too, but says fixed-wing planes make more sense in various situations. The French Army is in the process of defining the armament and other characteristics of its future Airbus H160M helicopters, which will replace its aging Aérospatiale SA342 Gazelles in the armed scout role. At the same time, particularly given the demands of France’s broad counter-terrorism campaign in Northwest Africa, the service is looking at light attack aircraft to supplement scout and gunship helicopters in certain circumstances and as cost-effective alternative to expensive multi-role combat aircraft. That which is old is again become new. Chris Pook: Hurribomber (12 guns)? Hurricane Mk IIB Hurri-bomberThe Mk IIB saw the twelve gun wings finally become standard, with two extra .303 Browning machine guns located further down the wing. Of more significance was the addition of two bomb racks, down the wing from the landing gear. At first these were used to carry one 250 lb bomb each, increased to 500 lbs by the end of 1941. 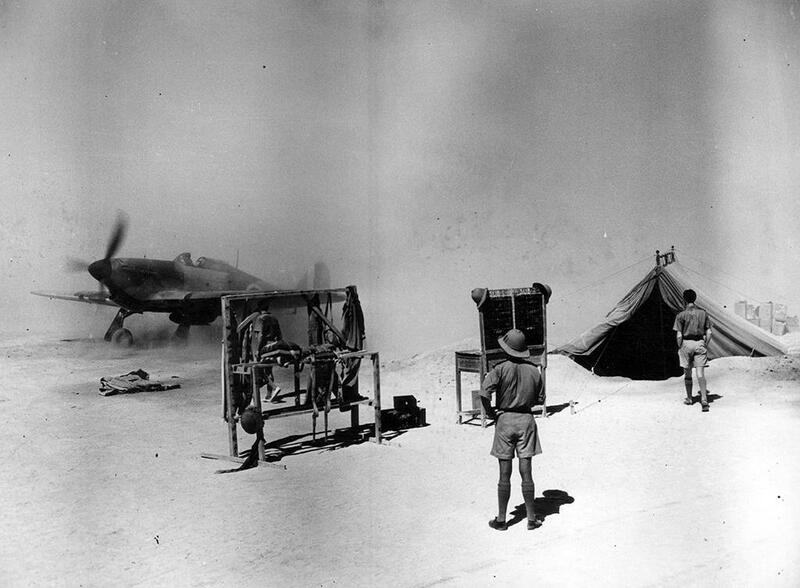 From the autumn of 1941 the Mk IIB was used to bomb small targets in occupied Europe..."
Picture showing a Hawker Hurricane IIB Hurri-bomber being armed with with its second bomb. This aircraft has the twelve gun wing, but one of the four inner guns appears to have been removed or sealed up. The Air Force is preparing to begin buying light attack aircraft next year — and the winner is going to be either Textron’s AT-6 Wolverine or the Sierra Nevada Corp.-Embraer A-29 Super Tucano. According to a pre-solicitation posted on FedBizOpps on Aug. 3, the service will put out a final request for proposals to the two competitors in December with the hopes of awarding a contract by the end of September 2019. However, Air Force spokeswoman Ann Stefanek told Defense News on Monday that service leaders have not yet made a final decision on whether to green-light a program of record [emphasis added]. Should that happen, the pre-solicitation will ensure that the service can move as quickly as it would like to eventually procure new planes, she said. Fine planes though they be none can match the A-10. Then there's always this one. BREAKING: USAF releases notice disclosing firm plans to acquire a Light Attack Aircraft fleet in late 2019. RFP coming in December 2018. The notice advises potential bidders only Sierra Nevada/Embraer A-29 and Textron Aviation AT-6 may be considered.